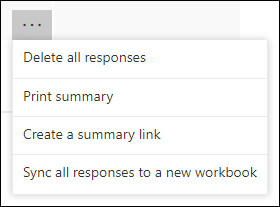 When you create surveys, quizzes, polls, and other types of forms with Microsoft Forms, you can print a summary of responses or responses for an individual responder. 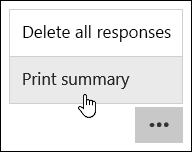 On the Responses tab, click the ellipses button (...), and then select Print Summary. 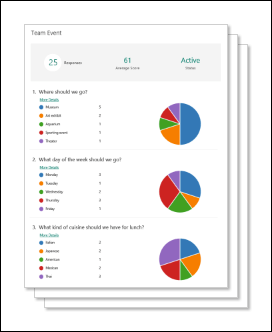 This will print a summary page of your form questions, number of responses, and a colorful chart for each response that shows a breakdown of that response. On the Responses tab, click the View results or Review answers button to see individual details for each responder. Next, click the ellipses button (...), and then select Print response. This will print all responses for the individual whose responses you're currently viewing. Many scenarios call for printing forms with responses. While there isn't an easy way to print forms without responses, you can request this particular feature. Please visit the Microsoft Forms User Voice site to provide suggestions and vote on ideas others have already submitted.